/ Modified aug 1, 2018 7:45 a.m.
Arizona gubernatorial primary candidates, 2018. Top row from left, Republicans Ken Bennett and incumbent Gov. Doug Ducey. Bottom row from left, Democrats Steve Farley, Kelly Fryer and David Garcia. Graphic by Ian Ingle for AZPM. Arizona’s education funding consistently ranks among the lowest in the country. It also is a top-three issue for Arizona voters. Nobody is proud of Arizona’s ranking. All five major-party gubernatorial candidates say they want to improve the state’s public schools, how they accomplish that is where they differ. 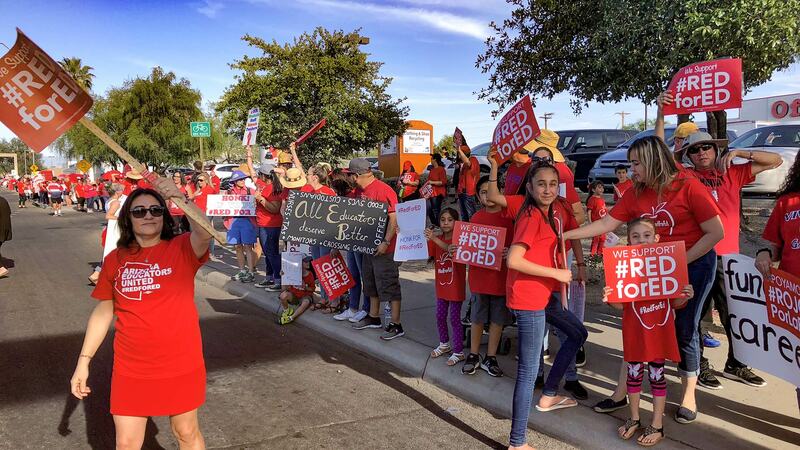 Earlier this year, the #RedforEd movement and the five-day teacher walkout brought the issue to the front doors of the state Capitol. Gov. Doug Ducey, who had previously said teachers would not get the 20 percent raise they demanded, changed his mind during the strike and helped come up with a plan to give them what they wanted over a three-year period. It is not a point Ducey campaigns on. “The teachers have earned and deserve this raise. It predated my administration, the recession Arizona was in, but we've dug out of that. We've restored the private-sector jobs, we've got an economy that is really growing right now and we got those dollars to the people who deserved it the most, our public school teachers,” said Ducey. Ducey’s Republican opponent, Ken Bennett, agrees that teachers should get a raise. He does not agree with the approach constructed by Ducey and the Legislature. “They didn’t give the 20 percent by the way,” said Bennett. He is not wrong. The plan proposed by the governor and passed by state lawmakers gave a 19 percent raise over three years. It is 20 percent if you include the 1 percent raise approved by the Legislature in 2017. Bennett said the other problem with the plan is there is no guarantee teachers will actually get their money. “One legislature cannot bind a future legislature. So the first 10 percent was put into the budget, but the Legislature and the governor do not give teacher raises. They appropriate money in the budget to the schools and school districts and then the local boards decide what the raises are going to be,” Bennett explained. Bennett, like others, wants to see more money for classrooms. But he said the state doesn’t have to raise taxes. Instead, he wants to tie school funding to whether or not students achieve. “I think if we have funding that is based on whether we accomplish those levels, that can influence what is really going on in the classroom,” said Bennett. When asked about improving education, Gov. Ducey said that task is about more than just money. “I don't think you can just look at one component on this. I've said that any budget that I put forward we will put additional dollars in over and above inflation and that I would veto anything less. But it is not just about dollars. Dollars should not be the measurement of success. It's got to be the reforms and the results that happen for our kids inside the classroom,” said Ducey. Does more money mean a better education system? Experts say it doesn’t hurt, but improving education is more complicated than just cash. “We lose more than 50 percent of all the teachers in our community before four years, so they never get a chance to develop expertise, they leave the field. New teachers come in, they are beginners. They are just learning their craft. So why do they leave? One of the biggest reasons in this state, which is not necessarily true nationally, is compensation,” said Ronald Marx, dean emeritus at the University of Arizona College of Education. When it comes to politics, nobody is rooting for Arizona’s students to do worse in school. But Democrats have ideas that differ from Republicans. The three Democratic candidates for governor all support the ballot initiative that would raise income taxes on those who make more than $250,000 a year. But the Democratic candidates differ on the best way to raise more money and what to do with it. Candidate Kelli Fryer’s plan for funding is similar to the ballot initiative but it goes further. “We could reverse that capital gains tax cut from 2012 that overnight drained $500 million from our state budget. There are other avenues that we can take,” said Fryer. Candidate Steve Farley is a state senator. He has long called for a review of sales tax exemptions. He said eliminating some of those is an easy way to bring in more money. He shares that idea on the campaign trail. “We can actually increase funding while lowering taxes, and that is the magic of stopping these special interest giveaways,” said Farley. When backers of the education funding initiative turned in signatures at the Capitol, candidate David Garcia was there. He has continually said during the campaign that education must be improved. “We have asked our teachers and our schools and our education support professionals to do a lot with very, very little and I believe we have basically tapped that out. We need to now invest in the good work they are doing,” said Garcia. Getting additional funding from state lawmakers is a difficult proposition, whether the governor is a member of the legislative minority or not. “The political philosophies of the two parties are aligned in our state in such that the Legislature is reluctant to spend money, and they haven't. They have not spent a lot of money. They have added new money in, like the recent raises, and the governor negotiated that piece, but that was in response to a lot of political pressure,” said the UA's Marx. 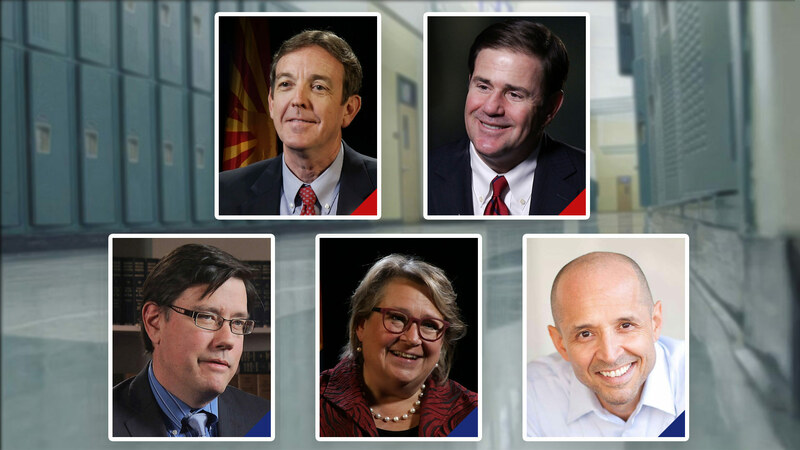 The three Democrats in the race to be governor say it will take more than money to improve Arizona’s public schools. Garcia campaigns on teachers being treated as professionals, just like university instructors. He is a professor at Arizona State University. “We are not asked to work through a scripted curriculum, we are not asked to get our students through a multiple choice test. We are asked to teach our students to think and do and go out and be creative,” said Garcia. Farley agreed teachers need more freedom in the classroom, but he said improving education in Arizona should not focus just on K-12 education. “We need to still invest in the fourth year of JTED programs for career and technical education. We need to invest in all-day K to make sure all all-day K programs are paid for. We also need to restore our building renewal formula to make sure our buildings are in good shape,” said Farley. When it comes to education issues other than education, Fryer accuses the Republican dominated Legislature of privatizing public education through charter schools. She said if elected, that will change. “My goal is to make charter schools in Arizona transparent, accountable and rare,” she said, adding that she would sign an executive order deal with charter schools on her first day in office. Teachers are expected to be a force at the ballot box this year. Political observers will have to wait until Election Day to find out how much of a force they will really bring.